Last Week – The weather was extremely pleasant for a long run last week, with temps in the high 60s, a cool breeze, and some sunshine. For August that’s quite a treat. About 25 runners join in on the run, but only about 5 did the full route. Its unusual to have more people training for halfs than full marathons, which made me think “what exactly is everyone training for?”. Let me know in your replies. This Week – It looks like we’re in for some similar weather, although it could get a little warmer along the way. The route this week is the old Law Enforcement Memorial Half which was held in Melrose around the turn of the century (this century, 2000). It later moved to Wakefield, a portion of which you’ll run next week, and ultimately moved to Boston when it grew up, becoming Boston’s Run to Remember. The full runners will run over to the starting line and complete the whole route, minus a lap around the Melrose High School track mostly because it doesn’t exist anymore, and then back to Brueggers. 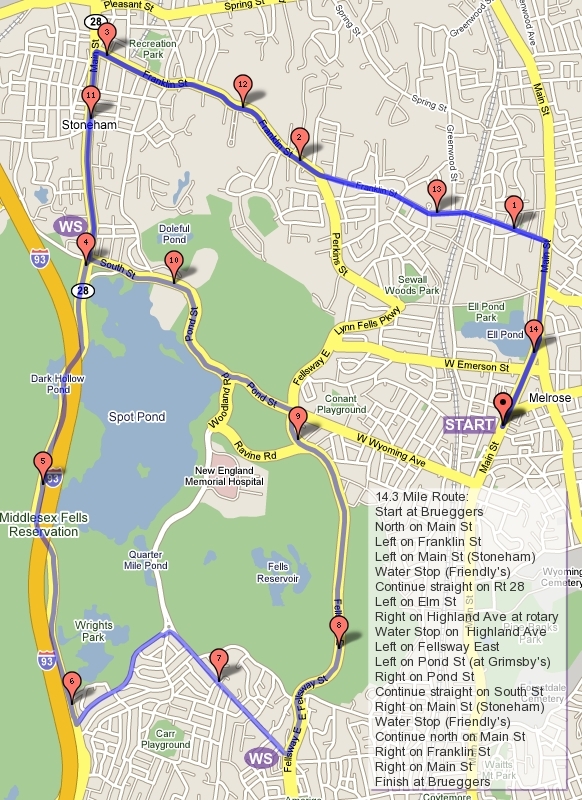 The half runners will skip a loop of Ell Pond, and cut the end of the route off. When you’re done running you’ll be halfway through the training runs for this season! Full/Half Start – Unlike most weeks, the start will end up putting the half runners ahead of the full runners. We’ll start together up Main Street, past Ell Pond, turning left on Melrose Street (before the LynnFells Parkway). Take a left off Melrose Street onto LynnFells Parkway and run past Melrose High School. This is where the Melrose Half started. the half runners will continue straight along the LynnFells Parkway to Grimsby’s. The full route runners will turn left at the set of lights at the tennis courts onto Tremont Street. Loop Ell Pond with a series of lefts onto Lake Street, West Emerson Street, back on to Main Street, Melrose Street again, and around to the LynnFells Parkway. This time continue straight past the tennis courts and over to Grimsby’s. There will be a little water stop there in case you need an early one. Full/Half 2 – From Grimsby’s you’ll continue on the LynnFells as it becomes the Fellsway East, through the hills, to the traffic circle where you turn right onto Highland Ave. Highland takes you up to the rotary at Highland where you’ll find a water stop on your left. Half Finish – As usual you’ll keep going straight through the rotary onto Woodland Rd, passing the Flynn Rink. Turn left onto Pond Street coming down the hill to Grimsby’s. Continue straight onto West Wyoming, turn left on Main, and finish at Brueggers. Full 3 – As usual loop Spot Pond by taking a left on Elm Street at the rotary. Turn right at the end of Elm onto the Fellsway West. Go up a hill, under I-93, past the Sheepfold, over I-93, past the off-ramp of I-93 (watch for fast moving traffic! ), and turning left into the Straw Point parking lot where you’ll probably find Hank. Keep circling Spot Pond by leaving Straw Point merging onto Pond Street, past the Stone Zoo, straight onto Woodland Rd, past Flynn Rink, through the rotary, and back to the water stop at Highland Ave.
Full Finish – Leaving the water stop, cross Highland to turn left onto East Border Road. Run up a hill and turn left at your first set of lights back on to the Fellsway East. As you run through the hills again remember I didn’t make up this route, it was an actual race. Run past Grimsby’s over one more hill, past Melrose High School. The race ended with a lap of the Melrose High track with spectators watching your hill weary legs trying to sprint. I’ll save you that embarrassment and instead you’ll run up to Melrose Street, turning right and right again on Main Street. Your hill weary legs will instead parade you through downtown Melrose as you finish up at Brueggers. Water Stops – I think I have Tom and Hank helping me out again this week. Ok everyone, the sidebar maps are back! The SLR Blog is created on the WordPress platform and unfortunately during the past week an update to WordPress resulted in an automatic update which unexpectedly blew away some of the customizations I’ve made for this blog. I’ll be fixing that over the next day. So last week we we survived the torrential downpour run to Breakheart. My trunk is still damp and musty from the inches of rain that came down upon the water stop. Runners were wet, but enjoyed the refreshing coolness of the morning. This week there is no rain in the Sunday forecast and temps should stay below 70, so we have that going for us. This week we’ll be running to Winchester. Again I’ll suggest that half route runners carpool to water stop 1 and run the middle portion of the route to change things up. Start – We’ll start up Main Street, past Ell Pond, continuing to Franklin Street where you’ll turn left. Continue along Franklin into Stoneham, past Stoneham High School, past Dunkin Donuts, then turning left at the next set of lights onto Summer Street. Summer will take you to Main Street in Saugus, where you’ll cross over to continue straight onto Marble Street. Marble will take you into Winchester, over I-93, where the road changes name to Forest Street. There will be a water stop immediately after you pass over I-93 on the left at Eugene. Half Finish – Half route runners will turn back over I-93, turning right at the set of lights onto Park Street. Park will become North Border Road and take you to Friendly’s. Cross over and continue straight as the road becomes Pond Street. After passing the Stone Zoo look to take a left to stay on Pond Street to get you to Grimsby’s. Take a left at Grimsby’s following the Lynn Fells Parkway past Melrose High School. Turn right on Melrose Street and right on Main Street, finishing up at Brueggers. Full 2 – Full route runners along with Alternate Route Half runners will continue down Forest Street, turning left on Highland Ave. Highland will take you up to Winchester Hospital. Turn left onto Reservoir Road. This will take you up towards the Middlesex Fells. Enjoy the views of forest, reservoir, gas lamp street lights, and stately homes as you loop back around to Highland Ave. Turn right onto Highland and continue straight through a 5-way intersection all the way to the end of Highland where you’ll find water stop 2. Full 3 – Take a right onto Main Street when you leave the water stop. This will take you to a little rotary where you pass a small road then turn at the next right off the rotary to stay on Main Street. There is a Symmes Farm Historical Site sign where you stay on Main Street. Keep on the right side of Main, when you come to a fork you’ll stay right to get on Washington Street. Washington will go through a 5-way intersection where you cross Mt Vernon Street and stay right on Washington. If you pass Winchester High School you went the wrong way, turn around and try again, you should pass St Mary’s Church. Washington will bring you to the Gingerbread Construction Company. Turn right there onto Forest and run up the hills back to the first water stop at Eugene. Full 4 – Leave the water stop on Forest Street crossing over I-93. Turn right at the set of lights onto Park Street. Continue straight to Friendly’s where you’ll turn right onto Main Street/Fellsway West. This will take you over I-93, past the Sheepfold, under I-93 to Elm Street where you turn left. Elm will take you up to a rotary where you go left and find Flynn Rink. The final water stop will be in the skating rink parking lot. Water Stops – I’ll need one helper to get through this one. I think Tom has volunteered, but if I’m not right is there anyone else interested in spending a beautiful Sunday morning slinging Gatorade? Who’s In? – Roll Call!!! Last Week – Big thanks to Tom and Audrey for handling the Horn Pond run last week. Sounded like a good sized crowd enjoyed a hot and humid run out to the little pond and back. This week – We’ll be heading in the opposite direction this Sunday, reducing the mileage a bit, but adding a series of tough hills to keep strengthening your legs and your resolve to finish. The weather seems… interesting. It’ll be in the high 60s, low 70s, with scattered thunderstorms in the area. We’ll watch for lightning, if it does occur during the run please continue running until you can duck into a shelter like a building, under an overhang, or into a car, until the lightning subsides. Remember if the time between seeing lightning and hearing thunder decreases that means the storm is coming your way. If they’re within a few seconds apart the storm is close, find some shelter! The Start – The group will start from Brueggers at 8AM. Again, if you’d like to start early aim to hit the first water stop around 8:20. The group will head up Main Street to Ell Pond, crossing to the right to veer onto Green Street, and then turning right onto the LynnFells Parkway. Follow the parkway to your first set of lights at the corner of Main Street in Saugus, taking a left there. Half route runners will take a quick left onto Howard Street where they’ll find a little water stop. Long Runners continue straight on Main Street in Saugus until it becomes Farm Street in Wakefield, stopping for a water stop in the Wakefield High School parking lot. Half Finish – The half route runners will return along Howard Street, turning left onto Green Street. At the lights at the LynnFells Parkway you’ll turn right and run the MRC summer route in the reverse direction: Lynnfells Parkway past Melrose High School, over to Grimsby’s and take a left onto West Wyoming and a left on Main Street to get back to Brueggers. Full-2 Breakheart Loop – The longer route will take up past the Northeast Metro Tech Vocational School where you’ll find the Wakefield entrance to Breakheart. Run the Breakheart Outer Loop in the counter-clockwise direction. First making your way through some challenging hills. Drive your legs up the long steep hills and then stay controlled as you let gravity take you down the steep downhills and into the next hill. This section will take you over to the headquarters where you’ll go left to continue around to the Breakheart pond. Stay right there as it takes you back over to the Voc where you’ll pop out into the parking lot and back down to the water stop. Full-Finish – To finish up you’ll run the same way back that you did in Week 1. Turn right onto Farm Street to the end, turning left at the T intersection onto Water Street. Continue into Wakefield Center, turning left onto Main Street. Follow Main Street back to Melrose Center, into Brueggers. Alternate Half Route – An option for the half route runners is to carpool to parking lot at the corner of the LynnFells Parkway and Main Street in Saugus and joining the long runners up Main Street in Saugus to Farm Street, around Breakheart, and then back along Farm Street and Main Street to their cars. Water Stops – I’ll take care of the stop at Wakefield High School. I need one helper at Howard Street for the half route. Volunteer? Who’s in? – Roll Call! This week’s Sunday Long Run will take us out Horn Pond in Woburn. Last week we had a pretty hot run as the group headed to Lake Quannapowitt in Wakefield for the morning. Overall the crowd was about 40 people, split equally between the half route runners and the full route runners, with a few improvising for something in between. I will be out of town this Sunday running a race (yes, I do run), and usually I pass off the SLR duties to Lois but she will be running with me, so this week the run will be hosted by Audrey and Tom. We’ll be venturing west through Stoneham into Woburn to Horn Pond. This has been a favorite for many over the years, one of the few routes we only do once a year. There are legends of a muscular shirtless man running around the pond that have been told over the years as well. If you’re into that sort of thing, keep your eyes peeled! The run will take off from Brueggers at 8AM, although as always anyone wanting to venture out slightly early can but keep in mind the first water stop won’t be set up until about 8:15 to 8:20. Half runners, if you want to experience Horn Pond feel free to carpool over to the first water stop and jump in there for a 7 mile run from Eugene to Eugene. The route will take you south on Main Street, past Marathon Sports and Dunkin Donuts before turning right at a set of lights onto West Wyoming Avenue. Follow W Wyoming past Grimsby’s and up Pond Street. When I say up, I mean it, a nice hill to start the day. This will take you to Spot Pond where you go right to keep on Pond Street. Watch for uneven terrain due to construction, it’ll be best to cross over to the pond side of the road and run on the sidewalk. Run straight past the Zoo as the street turns into South Street, and straight past Friendly’s as the street turns into North Border Road, and then straight past the I-93N on ramp as the street becomes Park Street. You’ll get to a set of lights and turn onto Marble Street, passing over I-93 into Winchester as the street turns into Forest Street. On your left will be a small side street named Eugene where you’ll find Tom at the first water stop. If you’re running the half route you can turn back onto Forest, back over I-93, and continue on Marble Street past Park Street and across Main Street onto Summer Street. Summer will go through one set of lights and then bend over to Franklin Street. At that set of lights turn right onto Franklin and head back to Melrose. When you hit Main Street in Melrose, turn right and head back to Brueggers. The full route will leave the water stop and head down, down, down Forest Street. Turn left at the set of lights at Washington Street where the Gingerbread Construction Company is, crossing over to the right side to take a right onto Cross Street. Cross Street will cross from Winchester into Woburn where you’ll hit yet another Main Street. Turn right on Main, and a quick left on Lake Street. Lake Street will take you to a… wait for it… pond, not a lake. Horn Pond. There is a parking lot off the right side of Lake Street where you’ll find Audrey prepared to give you a drink. From here circle Horn Pond clockwise. It should be pretty obvious how to accomplish this, stay on the main path, you’ll cross over a little section over the water and turn right onto a street, Water Street/Sturgis Street. Follow Sturgis up the big hill (although there is a path that skips the hill for the faint of heart) and turn right on Arlington Road. This will bring you along the side of Horn Pond… if you’re bored look for the planet markings set apart to represent the solar system. Once you hit Lake Street again you can take a right to grab more water, or a left to head back along the next section. If you are skipping the water stop let Audrey know when you come through the first time so she isn’t standing there all day waiting for you to come back. Head back the way you came along Lake Street, turning right on Main, left on Cross, back to Washington. At Washington turn left and cross over to turn right on to Forest. Remember when I said “down, down, down” on Forest? Now its time to pay that back with an up, up, up! The prize at the top is at Eugene where Tom will have more candy and drink for you. Now its time to finish off the 14+ miles along Forest, back over I-93, and continuing on Marble Street past Park Street and across Main Street onto Summer Street. Run through one set of lights on Summer and follow the bend over to Franklin Street. At that set of lights turn right onto Franklin and head back into Melrose. When you hit Main Street in Melrose, turn right and head back to Brueggers. Again, I’ll be away but Tom and Audrey have the water stops.